Saddleridge Family Escape is the perfect Big Sky ski-in/ski-out condo! This well appointed 3 bedroom condo with amazing views of the Spanish Peaks and a private hot tub is awaiting your next Big Sky Escape! Located within the Moonlight base area is the Saddleridge ski-in/ski-out condo complex and it is the perfect blend of convenience and value. Our condo is great for large families with many sleeping options and a well equip kitchen. This property does not have access to the private lodge at Moonlight. - Ski-in/Ski-out - 75 steps to ski-out and 300 steps to ski-in. 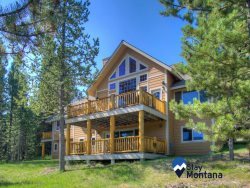 - Outstanding location - Few minutes walk to Moonlight base of Big Sky Resort, 7.5 miles to Big Sky Town Center, 60 miles to West Yellowstone Entrance. - Gas Range,Coffee Maker, Toaster, Crock Pot, Blender, Roasting Pan, Bakeware, 8 Place Settings, Basic Spices, Trash Bags, Dish Soap, Dishwasher Soap, Sponge, and Paper Towels.